Oxygen is drawn into the body from the atmosphere by breathing. Each lung is inundated by an estimate of 300 million alveoli, which are cocooned by numerous blood capillaries. Alveolar walls and capillary walls are extremely thin, this makes them permeable, therefore, oxygen passing into the alveoli immediately diffuses into the blood capillaries – the process takes up only .25 seconds in an adult at rest. The bulk of oxygen that diffuses into the blood binds itself to hemoglobin molecules that are found in red blood cells creating oxyhemoglobin. The smaller bulk of the oxygen that is left over dissolves into the blood plasma. Blood that is rich in oxygen (arterial blood) then flows through pulmonary veins, into the left atrium and left ventricle, and finally circulates throughout the entire body’s organs and their cells. Carbon Dioxide, which is a byproduct of cell metabolism, dissolves in the blood and is circulated back to the lungs where it is released as fresh oxygen attaches itself to hemoglobin and the cycle is replicated and repeated over and over again. The total amount of oxygen that is transported around the body is shaped by many factors: the lung factor which is the degree to which hemoglobin binds to oxygen, the anemic factor which is the hemoglobin concentration and the cardiac factor which is essentially the cardiac output. Oxygen saturation levels are an indicator of oxygen transportation in the body and point to whether oxygen is being supplied to the body, especially to the lungs in sufficient amounts. 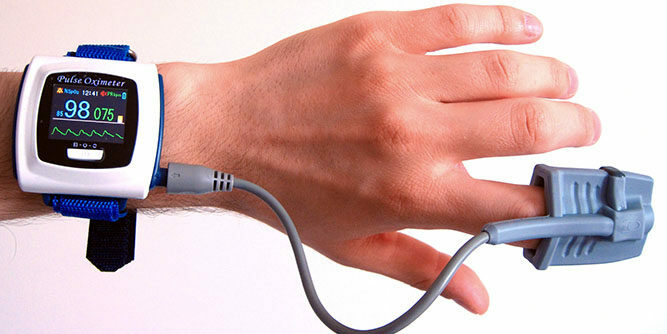 The pulse oximeter makes use of two frequencies of light (red and infrared) in order to gauge the percentage (%) of hemoglobin present in the blood that is dense with oxygen. The percentage calculated is called Blood Oxygen Saturation or SPO2. Hemoglobin molecules with attached oxygen molecules (Hbo2) absorb a different level of red and infrared light in comparison to hemoglobin molecules, which don’t have any oxygen molecule, attached (Hg). The difference range between absorption using an infrared light and a red light is used to gauge the SpO2 percentage. Each hemoglobin molecule can carry a load of four oxygen atoms and SPO2 is the sum percentage of hemoglobin molecules, which are oxygen-rich. Pulse oximeters also measure and display the pulse rate while measuring the SPO2 levels. SpO2 readings are recorded in percentages. Normal levels of SpO2 rest between range of 95-100%. 90% or less: This is the red zone; you need to consider consulting your doctor. 91 to 94%: This percentage is lower than average for the population. It requires you to monitor your situation closely. 95 to 100%: This is the average for the majority of the population, the SPO2 normal values. This level indicates that your red blood cells are dense with oxygen, meaning they are transporting oxygen around the body sufficiently and efficiently. Acute and persistently low SpO2 levels leads to a condition called Hypoxemia. Hypoxemia can pave way for various health issues including organ failure. Low oxygen levels can also cause serious problems such as lung disease and sleep apnea. These conditions may require additional oxygen to maintain the healthy functioning of cells and prevent long-term damage to them. Hypoxia can also be caused by asthma, emphysema, pneumonia, heart problems, and anemia. During exercise, SpO2 levels gauge the amount of oxygen that is reaching the muscles during a regular workout. This is why it is extremely important to know SpO2 levels just after any sort of activity. High blood oxygen levels indicate that the body will transport oxygen throughout the body at a faster rate, which will, in turn, make workouts efficient and intense. Low blood oxygen level mean that the body will transport oxygen to the muscles at a slower pace, which will cause fatigue and make the workout less effective. Essentially, blood oxygen saturation gauges the quality of heart and lung health. Lower readings indicate that the tester is unfit or suffers from an ailment or illness. In addition, one of the biggest negative influences of lung health is smoking. Smokers tend to experience drastic improvements in both their mental and physical health if they can gain control of their habit or completely curb it. Changes include better mood regulation, increased lung capacity, and improved fitness levels, and an overall increase in energy levels. Moreover, there are a variety of ways you can work to improve your blood oxygen level. Exercise: During workouts, the body has to work hard to keep SpO2 levels up. This can over time permanently increase SpO2 levels even when you are not exercising. An hour of aerobic exercise, for example, brisk walking, jogging, swimming, or dancing at least three times a week can make a marked improvement in your SpO2 levels. Fresh air: Sounds funny, but you can also increase oxygen levels by simply increasing the amount of oxygen you breath. Working out outside often can do this, opening windows in your house or offices, and increasing the number of live plants in your surroundings. These small changes will increase your fresh oxygen intake. Diet: Consuming foods such as raw fruits, green vegetables, seeds, and nuts will draw more oxygen into the blood and markedly improve SpO2 levels over time as they are rich in chlorophyll. Deep breathing: Oxygen deficiency can be dealt with by practicing deep breathing for a few minutes each day. Deep breathing entails filling the lungs to full capacity by expanding the chest and abdomen. Understanding blood oxygen levels is important for everyone. However, it is particularly useful for those who exercise and is essential for people who suffer from low blood oxygen levels, such as those diagnosed with sleep apnea. However, while SPO2 provides an insight into your blood oxygen level, it is not a complete and comprehensive measurement of a person’s health. SPO2 measurements with an SPO2 sensor or an SPO2 monitor simply merely indicate that a diagnostic testing is needed, or other treatments should be taken into consideration.